Drawing on the iPad makes good sense, and there are tons of apps that mimic natural paint brushes. 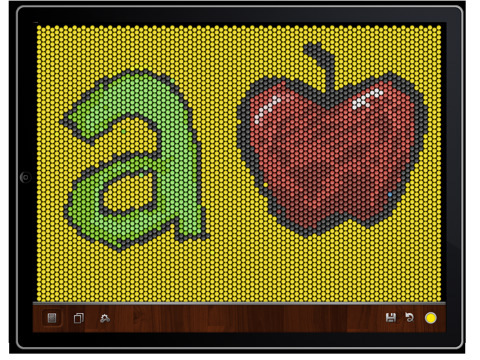 iBrite from aCleverTwist is a fun iPad drawing app that that takes a lighter approach to drawing on the iPad. It’s sort of like Etch a Sketch with colors and easier use. More precisely it’s a digital version of the classic toy Lite-Brite. You can undo your steps easily, use a customizable color palette and save and export your colorful art pieces. Using iBrite is super simple. Once you open the app, you’ll see a blank black canvas. Touch anywhere to place round colored dots (aka Light Pegs) on the screen. You can drag your finger to create lines. Dragging slowly fills in all the proverbial spots, while if you drag faster you’ll get a more scattered fill. To get more precise placement just pinch to zoom in on your drawing and place your colored lights with pinpoint accuracy. You can also draw over existing colors to replace a color. The overall feel of the app is something more carefree and joyous that can take the user back to the retro times. Using the iBrite app on the iPad feels natural and I kept going back to it daily to create something new, so there is definitely lots of reuse value here. It can be fun for both the younger audience as well. You can draw in both landscape or portrait modes and the menu adjusts accordingly. It was fun handing the iPad to some kids to see what kind of things they would create in iBrite, and they even picked up the simple interface in no time. The wood finished panel on the bottom lets you open the color box, undo (unlimited), save, create a new drawing, and view your saved items. There is no eraser tool which would be a nice addition. The color picker which has a full color spectrum, has space for 8 preset colors that you can drag and drop onto. Unfortunately these presets are not stored so you have to redo them each time you open iBrite. Tap and hold on any saved item to “Share this thang!” via email, save it to your photo library or upload to your Facebook account. There is also a drawing each week held by A Clever Twist who gives away gift cards to the best submissions. If you need some inspiration, check out some of the amazing art pieces created by fans with iBrite on the developer’s Facebook page. Emailed version of the iBrite creations are in png format at full iPad size of 768×1024. Saved iBrite files are great for using as your own custom iPad lock screen or wallpaper. We demoed the prerelease version of iBrite, and in the settings section there were only feedback links for reporting bugs, requesting features and sending out a “Love it, bear Hug”. Perhaps the full release would have more options for you as well. Overall, we love iBrite for bringing carefree fun to the iPad. You can spend a lot of time making something truly special, or spend only a few minutes and stimulate your imagination on the fly. Plus at only $1.99 iBrite is a great bargain to add to your iPad app collection. AppSafari review of iBrite was written by Joe Seifi on May 1st, 2010 and categorized under App Store, Art, Featured, Fun, iPad apps, Utilities. Page viewed 5789 times, 1 so far today. Need help on using these apps? Please read the Help Page. I’d have to acknowledge with you on this. Which is not something I usually do! I enjoy reading a post that will make people think. Also, thanks for allowing me to speak my mind!